3. 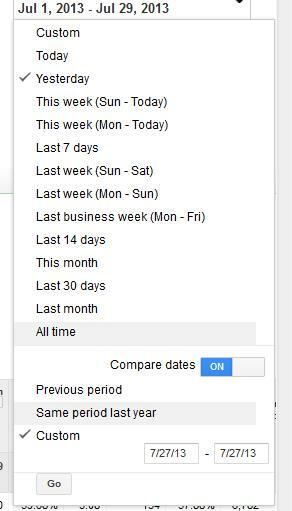 Look on Dimensions tab to compare a week to week or month to month. These were all annoying and imperfect solutions, which is why I was so excited about the new date comparison in Google Adwords. No longer will the ‘compare dates’ button only allow you to change the graph, now you can see the comparative data as detailed as the keyword level! You can look at comparative data on the campaign, adgroup, ads or keywords tabs.When choosing your time period, click on ‘Compare Dates’ at the bottom, then choose a time to compare it to. Expand any column that has a ‘+’ at the top. This will expand to show you two columns for the periods you are comparing, as well as an absolute change and a percentage change. You can sort by any of these four columns by clicking on the heading of it. If a campaign is much more expensive than last week. 1. Expand on cost, then click on the latest date range to sort this column by most expensive to least expensive. 3. Look in the Conversions and CPA column – if there are no corresponding increases in conversions, there could be a problem. 4. Look in the CPC and impressions column – are there big changes there? Where is the increase in cost coming from? 2. Sort by clicking on the last weeks stats to see where the most sales were last week, and compare to this week. 3. 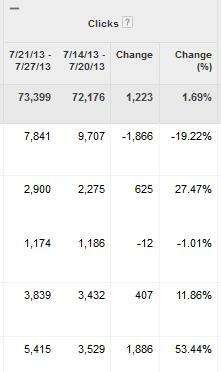 Expand CTR, Average Position and Impression columns to see the changes for those keywords that lost a lot of sales. These are just a few examples, there are a lot of ways to use this reporting feature, especially to quickly check changes in your campaigns. Have you ever wondered what the demographics are of people visiting your site or blog? Marketing is all about segmenting and targeting, so you obviously create your site with a particular target demographic in mind – but how do you know if those people are the ones that end up actually visiting your site? There are a few ways you can guesstimate your sites demographics; one is using Facebook’s Insights for Domains, which we’ll go through in a blog post of another day. Another idea is to set up forms on your site to collect submitted data, and hope for the best. If you are really committed, and have a bit of extra cash, you might consider third party solutions. And now there’s another way to estimate the demographic breakdown of visitors to your site, and (hopefully) it’s something you already have access to. Of course ad servers always want to know your demographic information so that they can serve you relevant ads – now this is coming around to help blog and website owners discover what demographics are on their site. All you have to do is (sorry) spend a bit of money on those ad servers – read:Google Adwords Remarketing (which you should really be doing already in some capacity. Remarketing is an excellent way to get more out of your PPC, Affiliate, SEO and other online marketing efforts). Google Adwords now shows you Gender and Age breakdown for impressions and clicks from sites on the content network. If you have a remarketing campaign in place, you can use this report to see what the makeup of your remarketing audience is – which can be extrapolated to (kind of guess) the breakdown of visitors to your site with regards to gender and age. 4. Google reports on the impressions and clicks of your ad from these visitors, and at that point will categorise them as male or female. Now, of course this isn’t going to be super exact, but it will give you an estimate – which is a lot considering the fact that you don’t actually want to infringe on peoples privacy here. Simply log into Google Adwords, go to your remarketing campaign, and click on the Display Network tab, then gender or age. Note that you can do this on all display campaigns, not just remarketing- so you can see what demographics are coming in on each campaign/targeting method. How does Google KNOW the visitors age/gender? Well, a few caveats. First of all – we aren’t looking at a persons age/gender. Google can only know the age/gender associated with a particular browser on a particular computer. So for shared computers you’re already getting a bit fuzzy. Then, Google relies on either self reporting (via a social network they have access to, for example, Google Plus), OR they sometimes guesstimate depending on the sites visited by that particular browser. Since behaviour isn’t always conclusive, and some people don’t self report, you will always have a bunch of clicks/impressions with gender/age ‘Unknown’. By breaking up your remarketing campaigns into products/services/articles/blogs/etc. You can segment your demographics even further to discover the audiences for particular segments of your site, and then deliver relevant content accordingly. This means you will have to use more advanced remarketing, by creating smaller audiences. This is very easily done in Google Adwords Library -> Audiences, so get segmenting now!